This is a city North of Ft. Lauderdale. A smaller and quieter version of Ft. Lauderdale. This has beach access, the Anglins Fishing Pier and lots of restaurants. These are photos taken from the A1A road heading towards Ft. Lauderdale. This is different from Ft. Lauderdale in the way the condos are set up. In Lauderdale By the Sea the condos are right on the beach, leaving the A1A drive with a view of the condos, or restaurants on the opposite site. In Ft. Lauderdale when you drive on A1A you can see the beach as the condos are on the far side of the road. 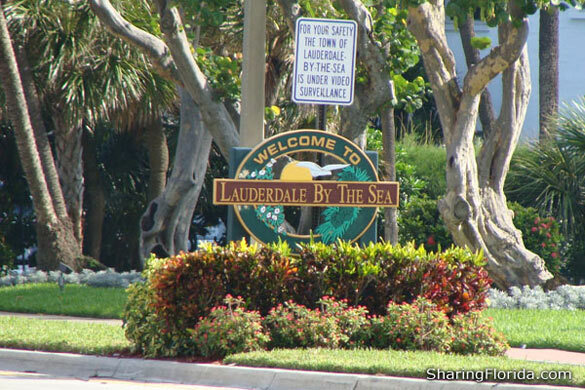 Beach access is limited in Lauderdale by the sea as the beach access is restricted to condo owners. There are several places the public can access the beach, but much more limited compared to Ft. Lauderdale.